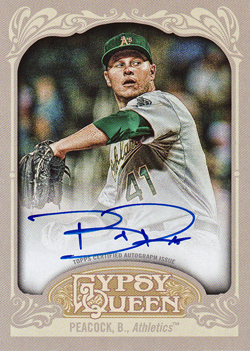 Whilst most of the baseball card brethren have turned their attention to the newly released 2012 Allen & Ginter, my gaze is remains firmly with Gypsy Queen. It is not that I would not like to join in the fun; but without a local card shop, Walmart or Kmart within 3,000 miles, I am forced to wait on the mail man to do his thing, before seeing if Kate Upton is going to find her way into my life! Fortunately, after a few quiet days on the mail front, a couple of packages arrived with some additions to what is effectively the inaugural set in my baseball card collection. 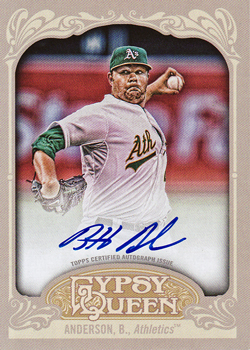 Up first are three autograph cards from the pitching fraternity. 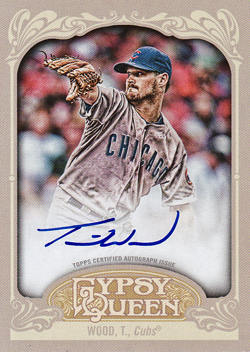 Cards featuring Brett Anderson, Brad Peacock and Travis Wood are unlikely to set the world on fire, as all three are in reality a long way from becoming All-Stars. Anderson (career stats of 21-23 and 3.66 ERA), is currently recovering from Tommy John surgery and has not been seen on the mound in over a year and Peacock (career stats of 2-0 and 0.75 ERA) is currently playing AAA ball with the Sacramento River Cats. Consequently, Wood is the only one of the three active in the major leagues. As things stand he has a 4-3 record, with an 3.05 ERA from 10 starts this year. He is next up on 17 July against the Marlins, so not having seen him pitch him before, I will see endeavour to see if the $3 I spent on his card is a worthy investment! Alongside the autograph cards, was a lot of 19 (Straight Cut & Gypsy Queen back) minis from a fellow Brit. The highlights from the lot are pictured above. Completing these two parallel sets feel like a pretty daunting task...but I'll probably give it a go. Well ,at least until I get sidetracked by Allen & Ginter mini cards!